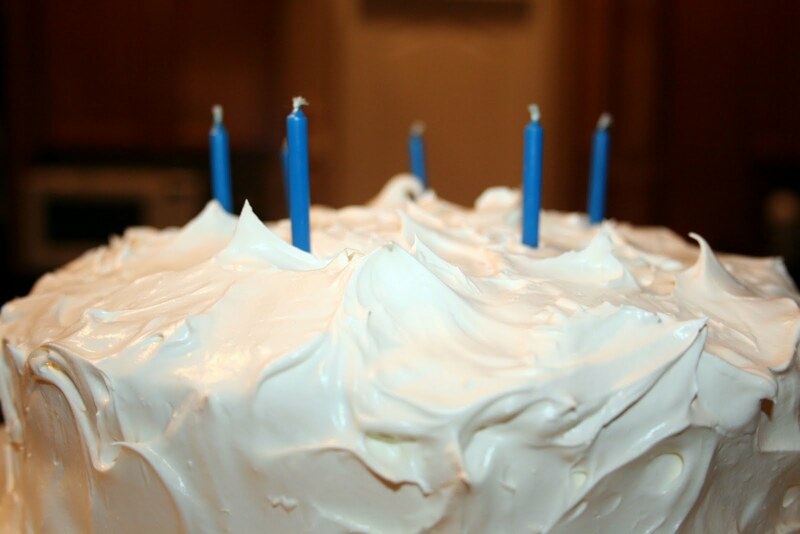 What is exciting about a plain, round, cake with dips and peaks of white frosting? 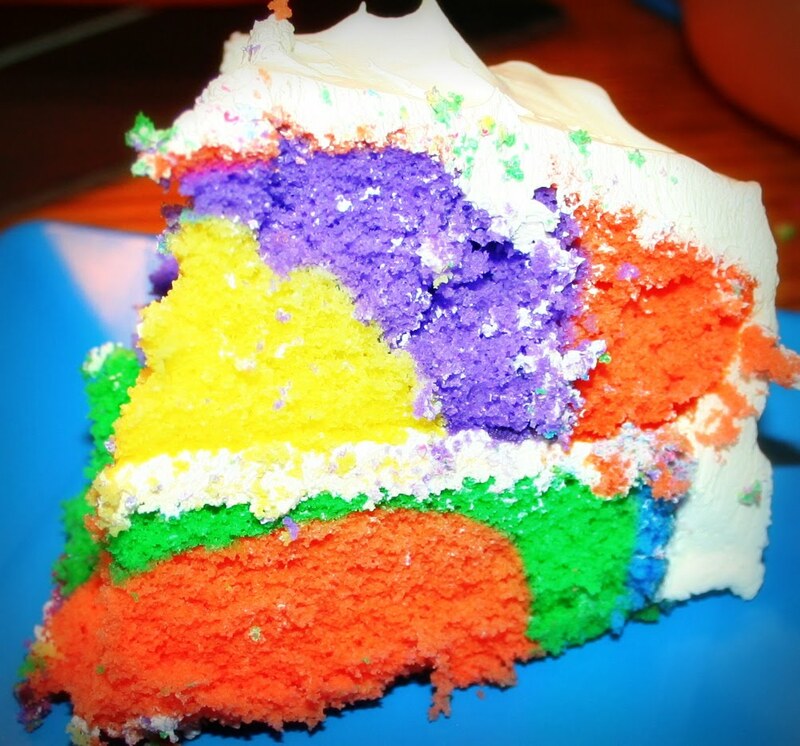 This unassuming cake looks dull for a little 6 year old's birthday...BUT...a surprise burst of color is revealed when it is cut into! 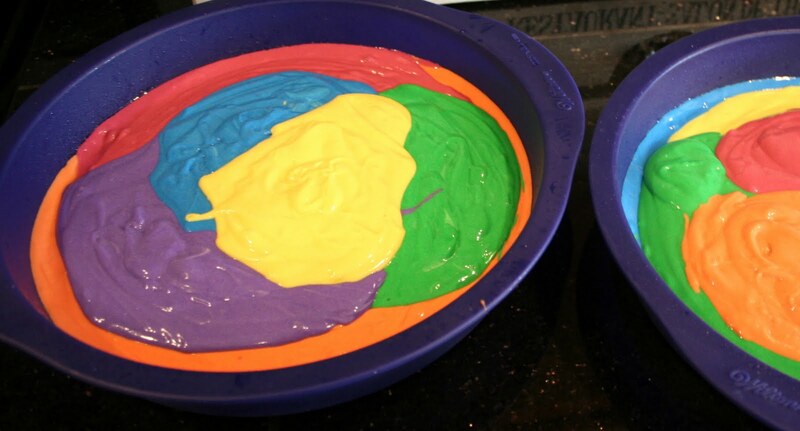 The COLOR cake for Titus! 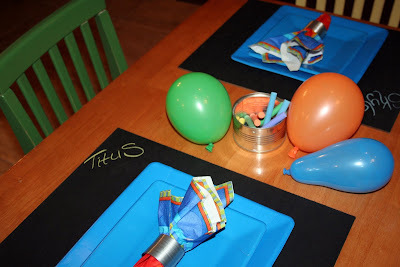 The central theme for Titus' SWEET SIXTH birthday was all about COLOR! 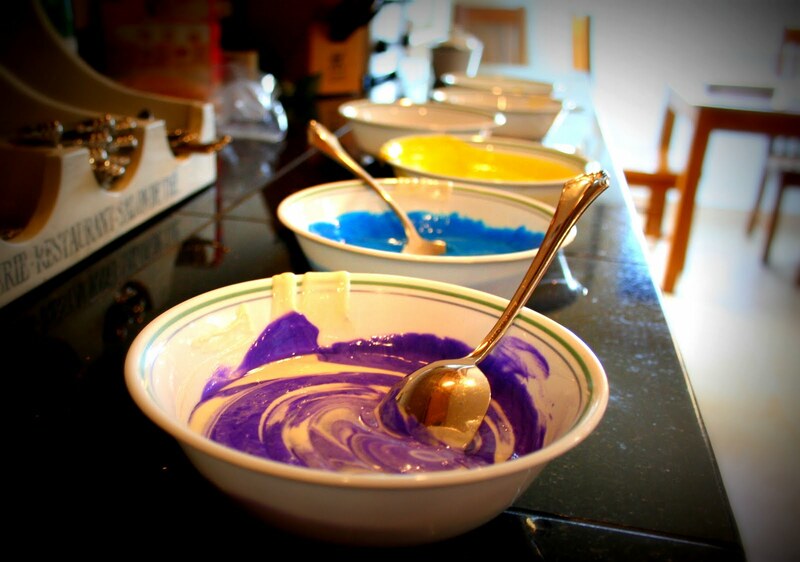 We kicked off the theme earlier with these super colorful swirls of LOLLIPOP COOKIES. To finish Titus' birthday celebrations we had an intimate family dinner party, once again, swelling with color. -I made chalkboard placemats by buying a big sheet of wood from Lowe's and cutting them into placemat size. -I then painted each placemat with chalkboard paint. who completed our team of boys! I used mini slinky toys for napkin rings! We served an Italian dinner with CARRY OUT PIZZA as the main course. 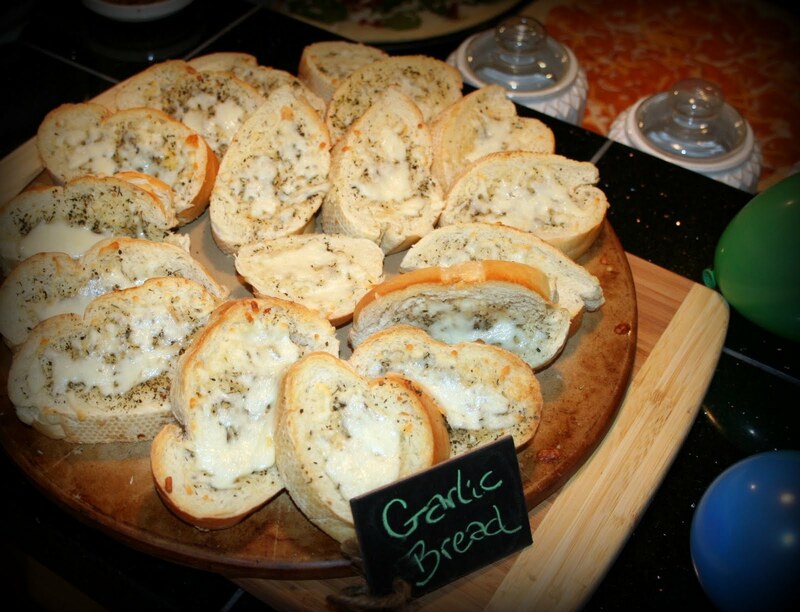 with bubbles of mozzarella cheese! 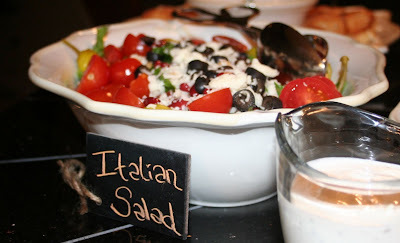 with homemade creamy Parmesan dressing. I would like to share something from my heart before I call it a wrap! Usually parties and dinners come together fairly easy for me (just like math problems or sewing may come together for YOU...but not for me!). However this night, I was a victim of my OWN poor time management and planning for this little event. This caused a nervous rush as I was working to the minute to have it all complete before the evening began. Thank goodness for my cousin Jessica and her quick help! That girl can get things done...it's crazy! The TONE of a household is much more valuable than the PRESENTATION of a household. And now, loveies, it's a wrap! First...AMEN! The Happy Mom, with kind and gentle words, is the best gift a child can receive. But, remember, you are human. 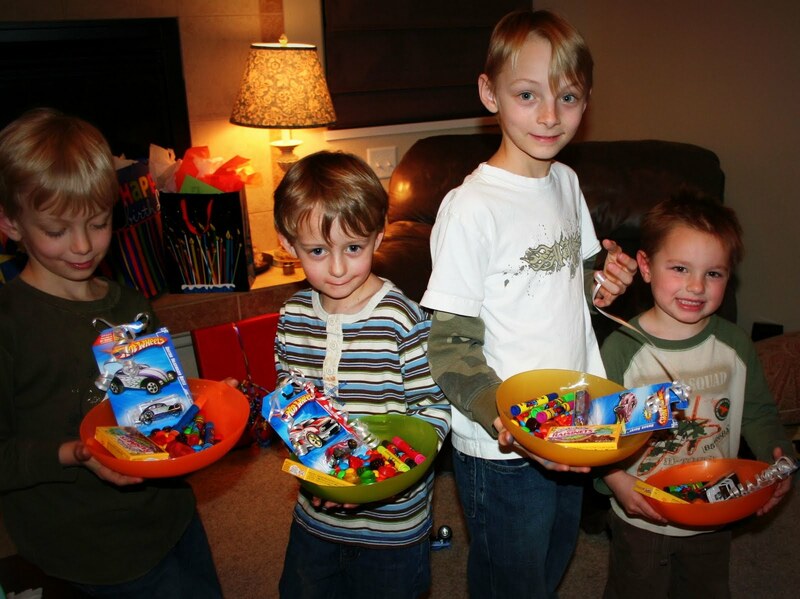 The boys may remember some of the "psycho mom" (what my kids called me) moments, but they are forgiving...especially as they grow up and understand stress. 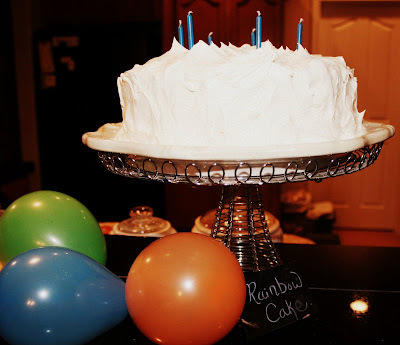 Second - Your party idea is wonderful! I love the cake!!! I think I will use this idea for an Easter cake. 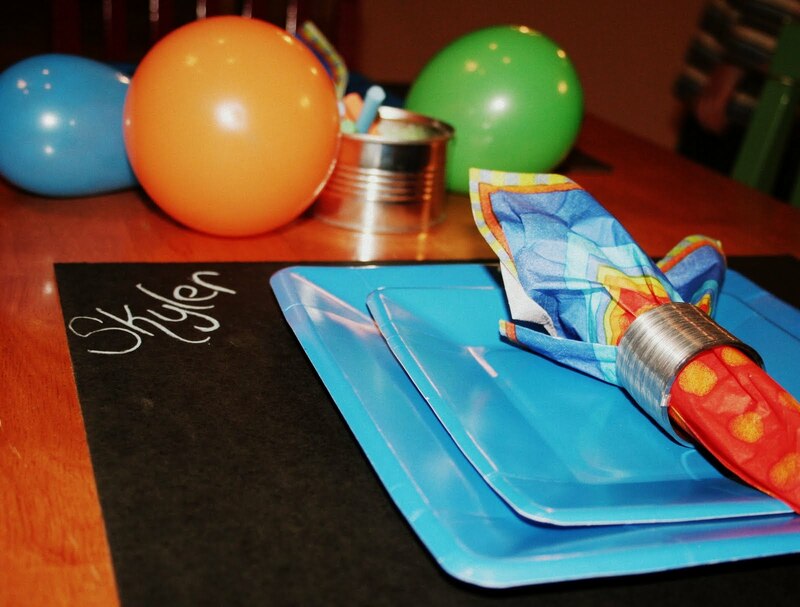 And the chalkboard placemat idea is just perfect for a child's party. I love your creative mind!!! Did you purchase those chalkboard placemats? They is way awesome! Okay. I need you to adopt my family and be in charge of all gatherings and celebrations. Okay? What a neat idea for a 'surprise' inside the cake!! Cute party and the Lord has used your lesson and you the vessel for sharing it..I so needed to read this! Thank you. I LOVE it! This is something I actually feel like I could attempt. Could you please post your salad recipe?? It looks SO good! Oh, bless your heart. Boy, do I understand what you're saying here. I have been without computer access for over a week, and when I logged on to read the blog comments, I saw yours and raced to go vote. Apparently, I was too late, but congrats on your win! I'm SO proud of you!!! :-) I remember and loved that party idea. I kind of snipped at Mr. Magpie (who has been an angel of late), and I was so sorry when I saw his expression so I know what you mean. Thanks for your gentle reminder, and that cake looks like loads of fun! I'm not supposed to be blogging today as I have home repairs and other things to supervise, but I had to drop by and tell you I tried to vote. You are always my pick! Your post is just FULL of clever ideas! 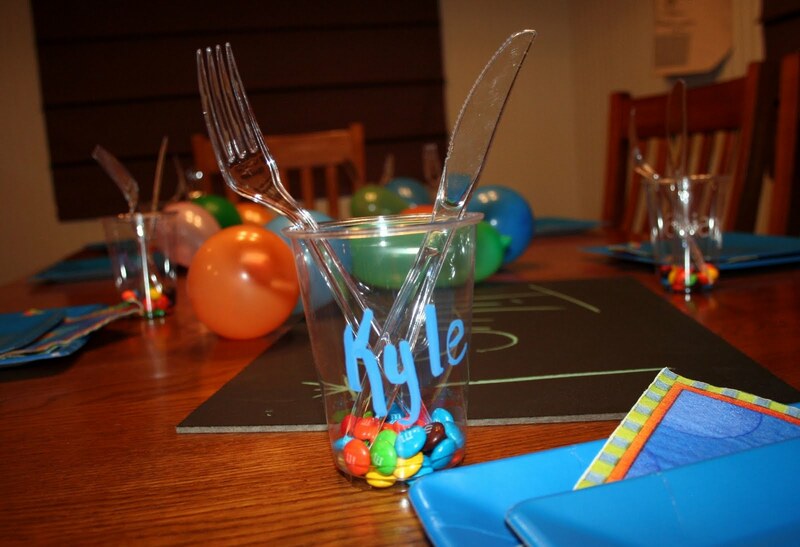 I know your guests loved all the special touches for the party. LOVE the chalkboard placemat idea! I love that cake! What an fun party with tons of color. That salad looks amazing. Another fabulous party! Now THAT is one cool cake! And such fun ideas for this party! I am definitely going to have to file these ideas away for future use. Found my way here through Just for the Joy. 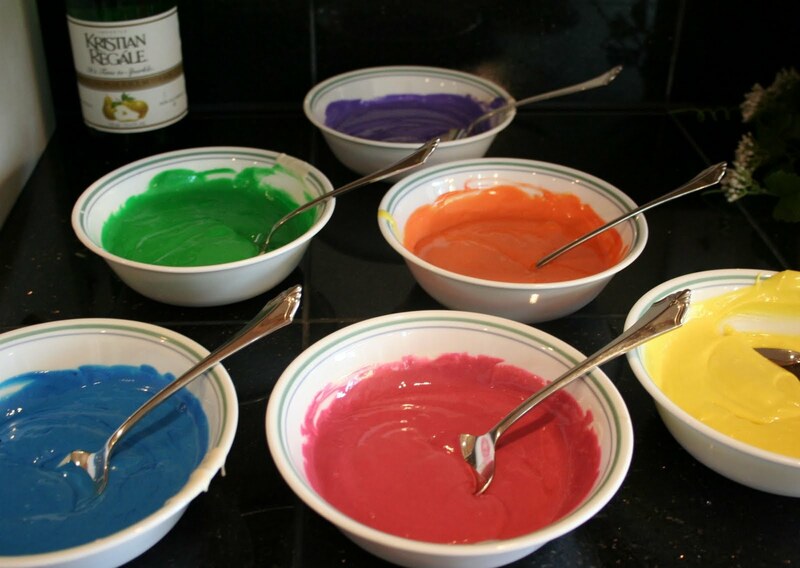 I linked to my recipe about rainbow cupcakes. :) Hooray for fun cakes! Wow Lisa! You ROCKED it! I can see how the cake was a huge hit!! My son is turning 2 on Monday, but I was just going to make a boring chocolate cake... but now I'm thinking I'm might need to stretch myself! 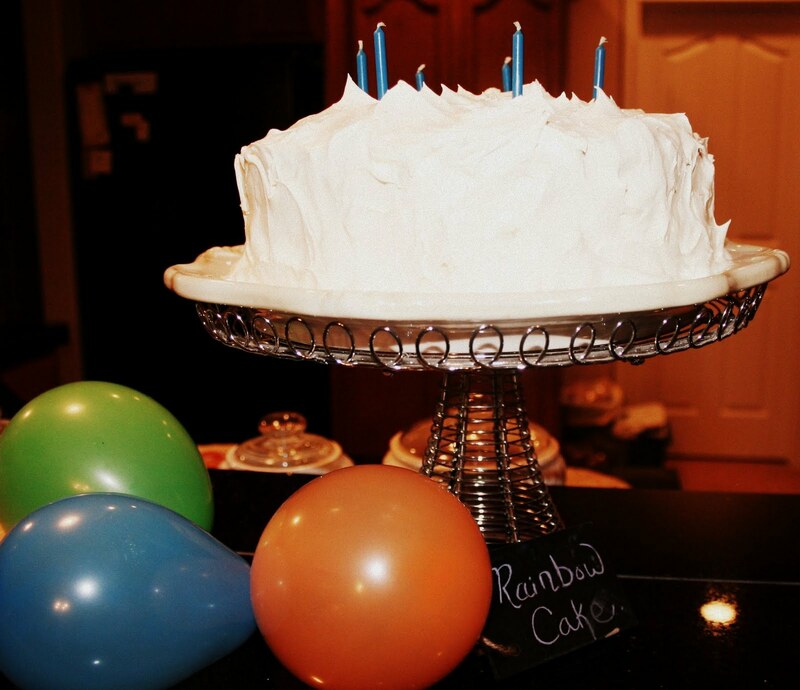 Thanks for sharing you JOY with us.. and happy birthday to your Six Year Old Sweetie! What a fun party-and a great reminder. They heart of things is what is most important! Cutest party Lisa! I posted about it in my Friday Favorites today. Wow that a GREAT idea!! I want to try it! it's sometimes hard to enjoy a party that you throw yourself! Wow! What a surprise inside your cake! 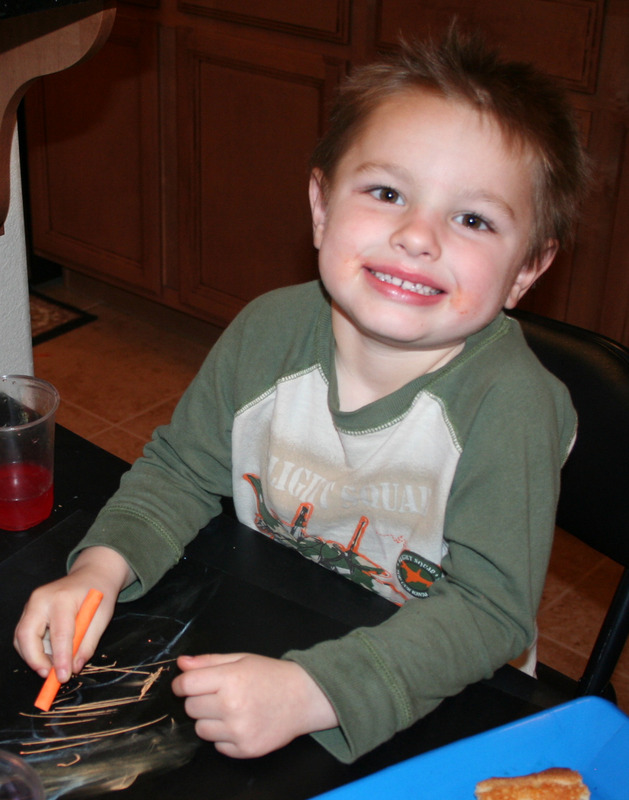 I'm so borrowing (stealing) that chalkboard placemat idea when the grands get older! Brilliant! I LOVE, LOVE, LOVE this cake!! Its sooo pretty! The placemats turned out really cute too! And, I want that garlic bread! So many great ideas--love them all. I'm just squealing over your chalkboard placemats! I should have done that instead of buying chalkcloth hoping to make a tablecloth. So more practical for kids! What a great cake! Oh, I've gotta try it! Very wise words! Thank you for sharing.